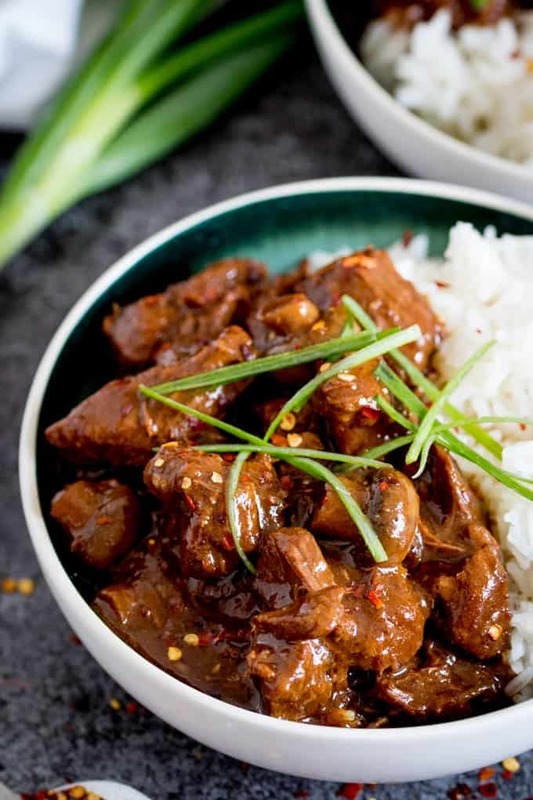 Big Batch Chinese Beef – A tasty, make-ahead meal of slow-cooked saucy Chinese beef. Perfect when you’re cooking for a crowd! I’m always looking for meal that I can make in bulk. Every other Sunday, the family gathers at my grandad’s house and we all squash in around the table in his kitchen. The kids have their own mini table – all set with a tablecloth and food garnishings (like the adult table), and we probably make enough noise to make his neighbours dread Sundays! Tea at grandad’s has been a thing since I was a little girl. My grandad used to make a big buffet with piles of buttered bread, meat, pork pies plus homemade fruitcake and scones. It’s not quite as easy nowadays for him to cook for so many people, so we take turns, bringing food for everyone to share. I live about 90 minutes drive away, so I find it easier to make something at home, then heat it up when I arrive. This means stews and casseroles are a definite favourite. 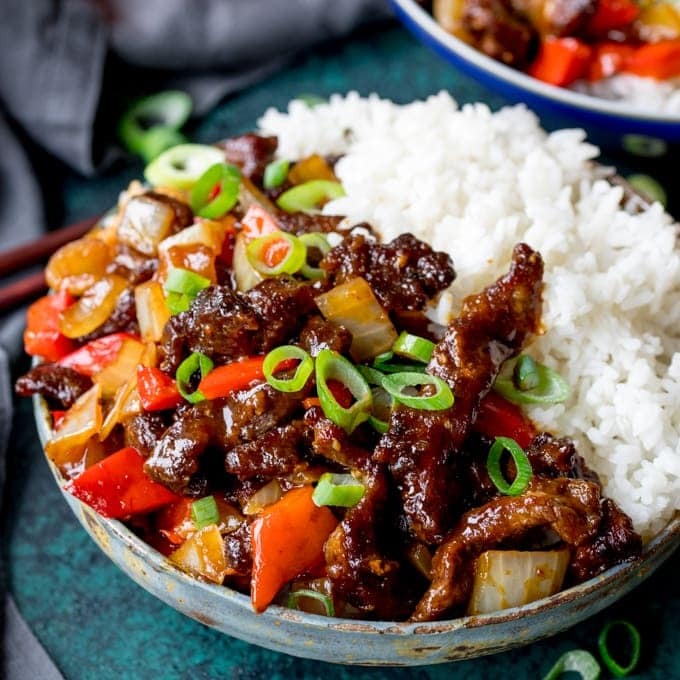 Chinese beef was my latest meal – served up with piles of fluffy white rice, chopped up spring onions, chilli flakes and some freshly chopped chillies for those that like a bit of heat. We all love this one – my grandad and the kids without the chillies, and everyone else with the chillies. I served it with some green veg – stir-fried broccoli and bok choy for a bit of added crunch too. Two kgs of beef cooked over the course of three hours, gone in 10 minutes flat! If you like this recipe then why not try some of my other big batch or Asian recipes. A small mixing bowl to mix the coating/marinade ingredients in. Instead of a mixing bowl we use loads of these for mixing, prepping, and serving. A Large Bowl to coat and marinade the ribs. A cast iron heavy based pan or dutch oven. Or you could use a slow cooker for this recipe. 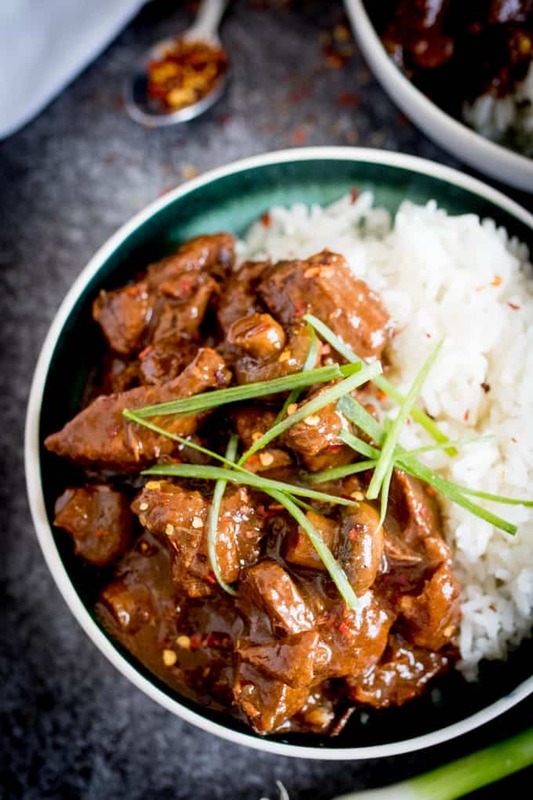 Big Batch Chinese Beef - A tasty, make-ahead meal of slow-cooked saucy Chinese beef. Perfect when you're cooking for a crowd! Heat the 1 tbsp of the oil in a dutch oven or large, heavy-based pan. Dredge the chunks of beef in the flour, salt and pepper and fry one third of the beef for 5-6 minutes until golden brown all over. Remove from the pan and place in a bowl. Repeat twice more, until all the beef is seared. Add the onions to the pan and cook on a low heat for a 5 minutes. If the onions are starting to catch (due to crispy bits left in the pan from the beef) add a tablespoon or two of water. Add in the garlic, ginger and five spice and stir though for 30 seconds. Add the beef back to the pan, along with the beef stock, soy sauce, brown sugar and the mushrooms. Bring to the boil, stirring a few times to release any remaining crispy bits from the bottom of the pan. 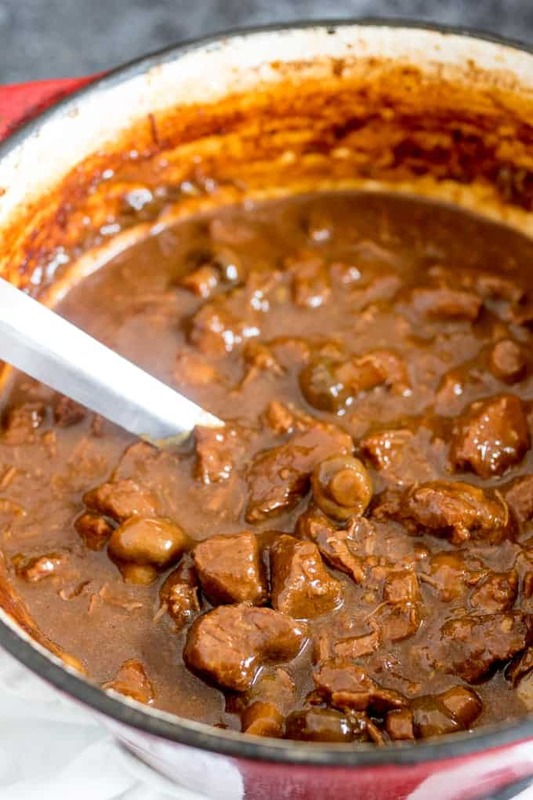 Place a lid on the pan and cook in the oven for 3-4 hours – stirring a couple of times during cooking - until the meat begins to fall apart. You can add a little more water or beef stock if it starts to look too dry. 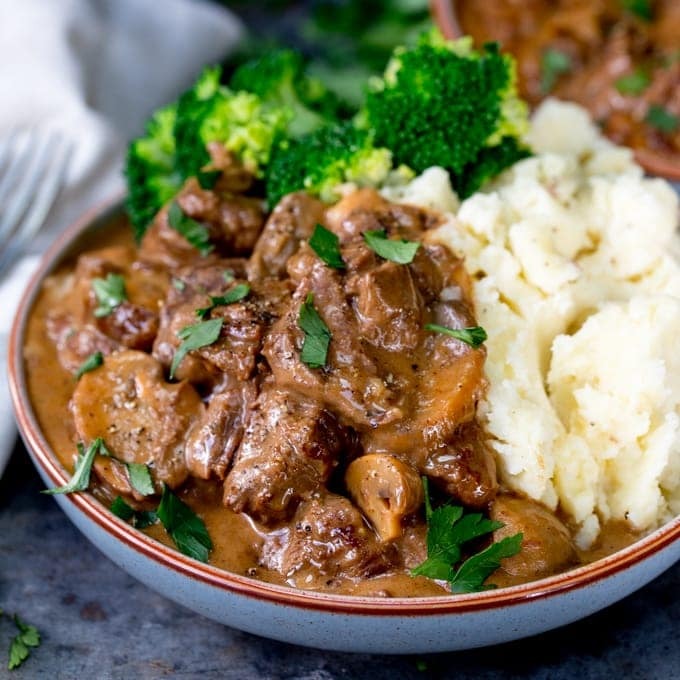 Alternatively you could transfer to a slow cooker and cook on high for 5-6 hours or low for 7-8 hours, or, you could cook on a low heat, on the hob, with the lid on for 2-3 hours. Serve with boiled rice and top with chilli flakes if you like, and some thinly sliced spring onions. I like to serve this with some green veg too - such as stir-fried broccoli or bok choy. Nutrition info is for one serving of this recipe, and does not include serving suggestions of rice or green veg. 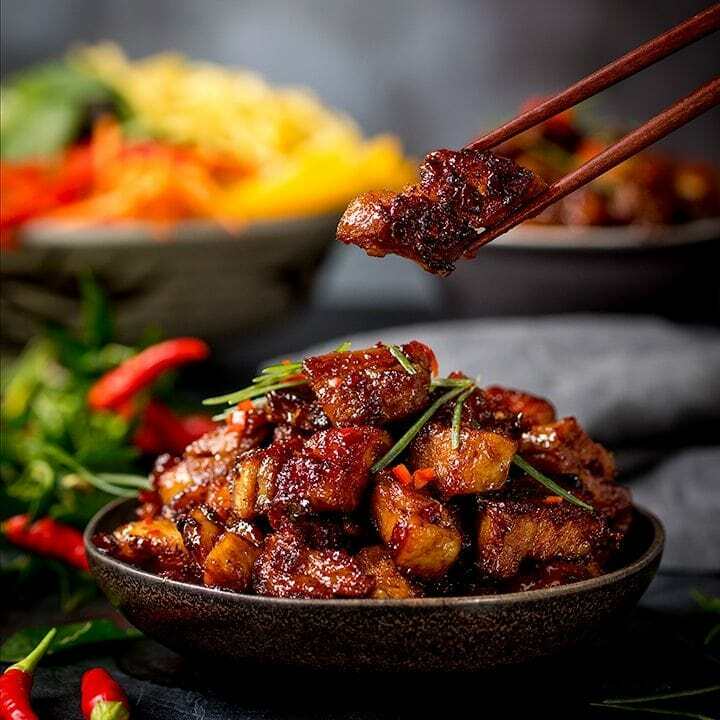 If you’ve tried my Chinese Beef recipe then please rate the recipe and let me know how you got on in the comments below, I love hearing your thoughts and add-ons to my recipes! Made this recipe for a Chinese-themed dinner and everyone loved it! The fresh ginger made the recipe. 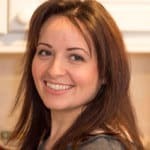 Just about to make this with just under 1kg (lastminute.com!) and wondered if it is with light or dark soy sauce and I have no brown sugar so going to use white.. do you think it will still be okay with white sugar? Hi Ita, it should be fine with less beef and using white sugar. I use dark soy sauce (Amoy). “…on the hob…”? Not helpful, really. 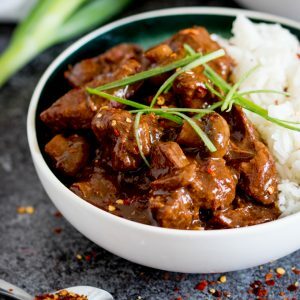 How would I cook it in a slow cooker? 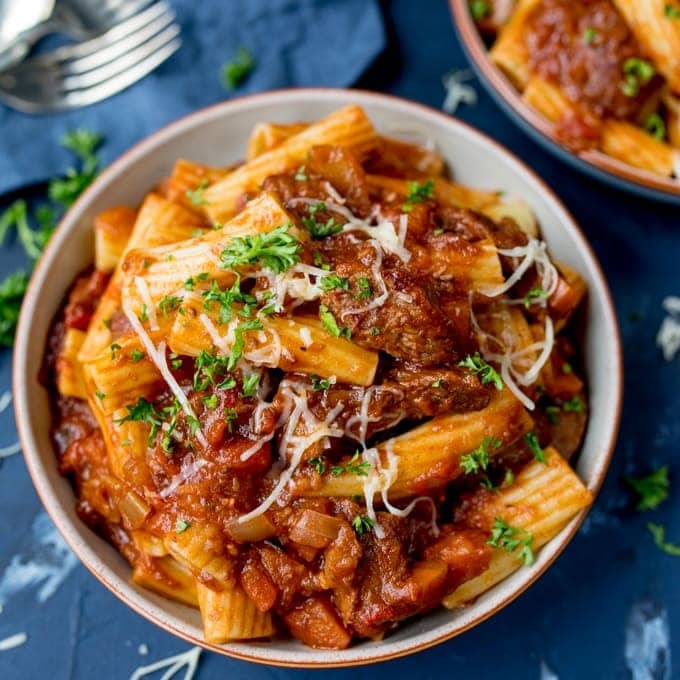 Hi, this recipe sounds really nice but I want to make it for two people not 12 could you please help me with the amount of ingredients I would need. I like to batch cook at the weekends and freeze portions ready for the days when I haven’t too much time to cook. This looks perfect. Seeing the comment from Louise that it freezes well, will be making this at the weekend. Great recipe and super tasty. I made double the quantity and used it for batch cooking served with a small portion of rice and lots of fresh vegetables. It freezes well and takes a lot of hassle out of mid week cooking. A firm favourite in my household! Love this big batch beef, lovely, great to freeze too. Not sure though when the ginger should be added, I added with the garlic and five spice. Would live more big batch, freezeable Chinese recipes, any suggestions please?. Thanks for spotting the typo Sheila. The ginger goes in at the same time as the garlic (I’ve updated the recipe now). I haven’t got any more freezable big batch chinese meals, but I’ll certainly try to get some more on the blog soon. Many thanks, will certainly try the curry sounds lovely. MMM… not only does it sound delicious! It also looks stunning! Not easy for a stew! I love making big batch meals that we can eat throughout the week. Little work upfront, but totally a time saver after! This looks delicious. Love the chili in there…big fan 🙂 This would make a perfect Friday or Saturday night meal. Pinned! Love this idea of making a big batch! Two dinners in one makes life easier. I am sure my kids would love the flavors in here, especially that Five Spice powder! This looks lovely! I’m going to try your recipe in the pressure cooker tomorrow.